For the third time in four weeks, we came away as a winner. In our first-ever weekly column that contained six picks, we went 5-1, with our only loss at the hands of the Minnesota Vikings (-4.5). 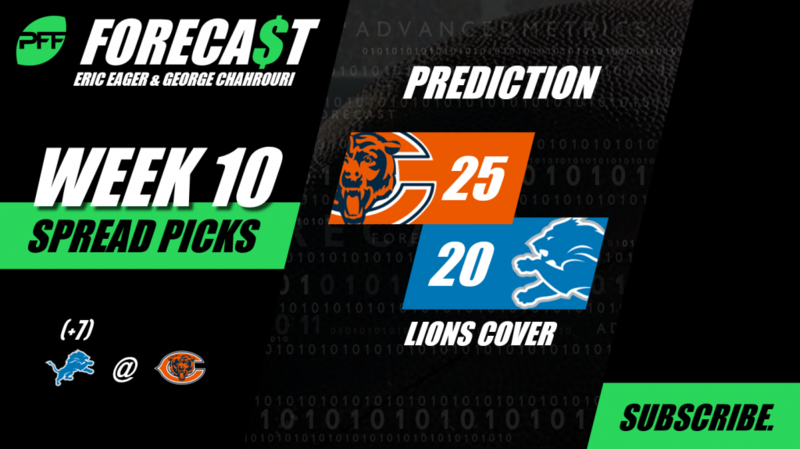 We’re 8-1 in the last two weeks, and our weekly picks column has a record of 69-59-6 (53.9%) since the beginning of 2017, including 51-37-4 (58.0%) against the spread. This week’s best game happened on Thursday night, which has left the weekend’s slate of games…light, so hopefully, there’s something in here for everyone. After the Steelers (+3) last week, we are now 18-11-1 on our “Lock of the Week” picks since the start of 2017 (62.1%), with five win totals still pending. Our Lock of the Week will be featured on the Sports Illustrated Gambling Show with our pick (visit PFF Greenline to see this week’s pick) this week. The analyses here will involve a point-counterpoint between the two of us for all five picks, using perspectives that only the PFF grades and data can provide. Follow us on Twitter at @PFF_Eric and @PFF_George, and for some podcast commentary on some of these picks, and the process that goes into them, give the PFF Forecast a listen. We will have a special Monday morning podcast each week with look ahead lines for the upcoming week. Point (George Chahrouri): Overreacting to Chicago’s victories over the Bills and Jets would be foolish, as those teams rank 32nd and 31st, respectively, in passer rating from a clean pocket. In a season where defenses merely show up to the games in order to spend a day away from their families, let us consider the quarterback position for a moment. One of the quarterbacks in this game has earned the worst PFF grade per snap (among quarterbacks with 165-plus dropbacks) to this point, and it’s not the one that is favored by a touchdown. The reality is: Mitchell Trubisky has not played well, despite the results. The Bears are generating the 12th-most EPA per dropback and Trubisky has had seven turnover-worthy plays that did not result in a turnover (third luckiest), so at some point, the process and results should head back towards each other. The Lions have the better quarterback, receivers, and old Eminem still isn’t as off his rocker as Kanye – Mom’s spaghetti keeps it within a touchdown. Counterpoint (Eric Eager): I agree with everything George says above, and that’s why this is our Lock of the Week. However, the strength of schedule thing was an issue with the Eagles during the early parts of the 2017 season, and it took them a while to come back down to earth against the spread, especially against teams like the 2018 Lions. While Mitchell Trubisky has graded poorly for us, the Bears have been as efficient on early downs as the Lions in the passing game, and have been much more so in the running game, in addition to leading the NFC in EPA allowed per early-down passing play (allowing -0.07 per play). With Golden Tate now in Philly and no practice for T.J. Lang or Darius Slay this week, this is going to be a sweat for us. Point (EE): The PFFalcons have left the nest, and as a father, I couldn’t be happier. Last week, they dominated a contending Breadsticks team that was able to generate pressure on Matt Ryan on only 12 of 40 dropbacks, and while Ryan didn’t have his highest-graded game in clean circumstances, he was able to throw for almost 300 yards and four touchdowns on those dropbacks thanks to a great supporting cast. Tevin Coleman and the Ito Integral both averaged over six yards per carry against the vaunted Washington run defense, while the Falcons defense played its part for the second-straight game. Cleveland is coming down from what is usually a peak effort in the first game for a new coach, and there is a good chance that rookie sensation Denzel Ward (allowing just a 73.3 passer rating into his coverage) will be limited with an injury. At the other corner spot, they exchanged one Gaines, E.J. (leading the NFL in passer rating allowed on his coverage) for Philip, another (who isn’t). Look for our Falcons to have their way in our home state and get above 0.500 for the first time on the year. Counterpoint (GC): The Falcons are hot and have games against the Cowboys, Saints, Ravens and Packers to look forward to. The Browns are horrific and have an offseason of rehabbing from the inflHUEnza that has beset them for the past three seasons. It makes too much sense for the Falcons to stomp all over the Browns. It will be freezing with winds over 10 miles per hour, which is not quite the Mercedes Benz Stadium. Ryan and company have been so hot they even let poor Julio come out of retirement to score a touchdown. Baker Mayfield has the ninth-highest rate of big-time throws so far this season (Ryan is 20th) which sets up nicely against a Falcons defense that has allowed the fifth-worst EPA per dropback this season. Should the Falcons offense sputter just a bit, this game could end in the low-20s and make a Mayfield cover a real possibility. Point (EE): Tess, Witt and Boog. For the second straight Monday night, we like a road underdog on the nation’s football holiday. While Boog will clamor for the Niners to run crossers to Jerry Rice and trap plays to Roger Craig in front of Frank Gore, the Giants will play in the here and now, leveraging an Odell/Saquon combination that might give those in Santa Clara nightmares of West Coast offenses of years past. The one problem for the Giants is that Joe Montana once had to sit out two consecutive seasons with an elbow injury, and it’s unclear to me if Joe the ordinary from 1991-1992 had a weaker arm than the current version of Eli Manning. Be that as it may, the Giants are coming off of an extended bye, Nick Mullens graded far worse than his Thursday night performance against our PFF flag football team would indicate (George was out with a hamstring injury) and there are questions about Jaquiski Tartt and Reuben Foster – players that will need to play well to keep Saquon Barkley from 350 total scrimmage yards in primetime. One of the tank jobs is an elegant one, and we’re choosing the other. Counterpoint (GC): The journey from San Francisco down to Levi’s stadium is arduous, but Nick Mullens has journeyman written all over him. Mullens was the beneficiary of some great plays by his receivers (handsome George Kittle for one) while he also faced a Raiders team that doesn’t have a single player who could start for Alabama. The New York pass-rush is not likely to make Mullens uncomfortable; they rank 26th in pressure rate and 31st in sack rate so far this season. Shanahan has worked overtime to thwart getting the top pick in the draft by somehow designing plays that have put the 9ers at 8.0 yards per attempt (ninth in the entire league). The last time Pat Shurmur and Boog met on the same field, Boog intimidated him from on high to the point where the Giants defense actually refused to get a stop, just to prove Booger correct. Not to add injury to Eli but Odell Beckham Jr. isn’t exactly known for dominating in a Bay.